The Global Volcanism Program has no activity reports for Hayli Gubbi. The Global Volcanism Program has no Weekly Reports available for Hayli Gubbi. The Global Volcanism Program has no Bulletin Reports available for Hayli Gubbi. Hayli Gubbi is the southernmost volcano of the Erta Ale Range. Recent tectonism has created a graben at the summit. A symmetrical scoria cone with a 200-m-wide crater displaying fumarolic activity occupies the center of the graben. An older shield volcano is covered on the north by recent fissure-fed lava flows. Lava flows from the axial portion of a fissure system extending to the south have reached the floor of the Giulietti Plain south of the Erta Ale Range. The open fissures extend for more than 10 km and are lined with dozens of small spatter cones and pit craters. The distal portion of lava flows issuing from the fissure system cover 8200-year-old sedimentary deposits on the Giuletti Plain. The Global Volcanism Program is not aware of any Holocene eruptions from Hayli Gubbi. 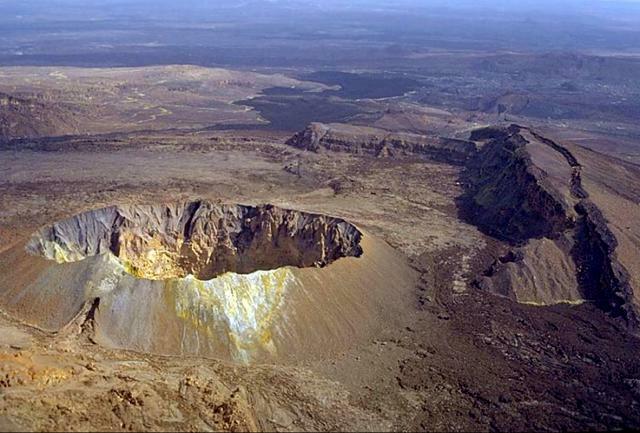 If this volcano has had large eruptions (VEI >= 4) prior to 10,000 years ago, information might be found on the Hayli Gubbi page in the LaMEVE (Large Magnitude Explosive Volcanic Eruptions) database, a part of the Volcano Global Risk Identification and Analysis Project (VOGRIPA). There is no Deformation History data available for Hayli Gubbi. There is no Emissions History data available for Hayli Gubbi. A symmetrical scoria cone with a 200-m-wide crater lies in the center of a graben that cuts the summit of Hayli Gubbi volcano, the southernmost in the Erta Ale Range. The cliffs at the right form the western side of the graben. Dark lava flows seen at the top center were erupted from the axial portion of a fissure system that extends for more than 10 km to the south. The lava flows have reached the floor of the Giulietti plain south of the Erta Ale Range. A steam column was observed from the crater in February 2002. 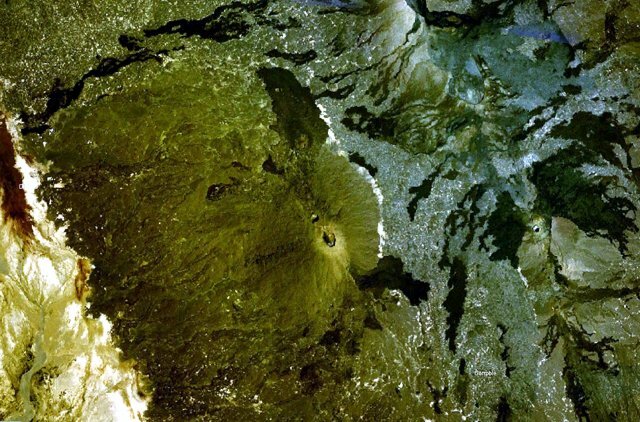 The prominent peak near the center of this NASA Landsat image (with north to the top) is Ale Bagu, also known as Ummuna. This elongated, 1031-m-high stratovolcano is the highest of the Erta Ale Range volcanoes, and unlike other volcanoes in the massif, is mantled by basaltic pyroclastic rocks. The main crater is a steep-walled, 750 x 450 m depression prominent in this image. The light-colored Roram Plain lies at the lower left, and lava flows from Hayli Gubbi volcano are visible at the right. There are no samples for Hayli Gubbi in the Smithsonian's NMNH Department of Mineral Sciences Rock and Ore collection. Large Eruptions of Hayli Gubbi Information about large Quaternary eruptions (VEI >= 4) is cataloged in the Large Magnitude Explosive Volcanic Eruptions (LaMEVE) database of the Volcano Global Risk Identification and Analysis Project (VOGRIPA).